Yorito Morimiya is obsessed with the sky. He especially loves taking pictures of its array of different faces—sunrises, sunsets, clouds. On one of his early-morning excursions to photograph the sunrise, Yorito meets a strange girl engaged in an argument with a vending machine. By the time that Yorito forces the girl's tomato juice out of the machine, she's vanished without a trace. 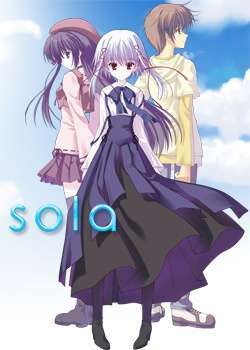 Sola follows the story of Yorito, his sister Aono, and their childhood friends Mana and Koyori Ishizuki, as well as that of a mysterious girl who appears and disappears, and who seems to harbor a dark secret. In a world where magic and the supernatural are never far below the surface and no one is who they seem to be, love and loneliness vie for supremacy beneath Yorito's sky.